There are WAY too many people or startups today that think“having a good idea” is enough. They think to themselves, “ if I have a great idea, people will naturally invest in me”. If you’re serious about building a successful startup, you need to be more realistic about how you raise new funds. Otherwise your brilliant idea will end up being just an idea. Well, today I’m going to share everything you need to know about startup seed round that almost guarantees that you raise funds from funding institutes. What is the Startup Seed Round? First things first, I will share the definition of seed round funding so you can have a better understanding. According to Manu, these terms are constantly evolving. As technology improves and it gets easier progress with less money, the definition for each round shifts. He indicates this in his definition as what was known as the seed round, is now referred to as pre-seed. Today, the new standard of the seed round is higher and accordingly, the Series A is also higher. Having said that, the definition for the seed round is considered a small amount of money given to a startup to give the momentum it needs to produce its initial product. At this point, startups normally have a business concept and will know if it has potential viability on the market. Seed round then gives startup just enough money to build a core team and produce prototype. So if you know that your market is there, what else do you need to know about seed round? How does an early stage investor value a startup to invest in? Well, there is this thing called startup seed valuation. Startup up seed valuation can be determined by the market size of the industry, and the sector in which the startup plays. Investors need to see if there is enough demands and supply of money, and the level of determination of the entrepreneur looking for money. Investors are taking risks, so you understand why they need to do this right! 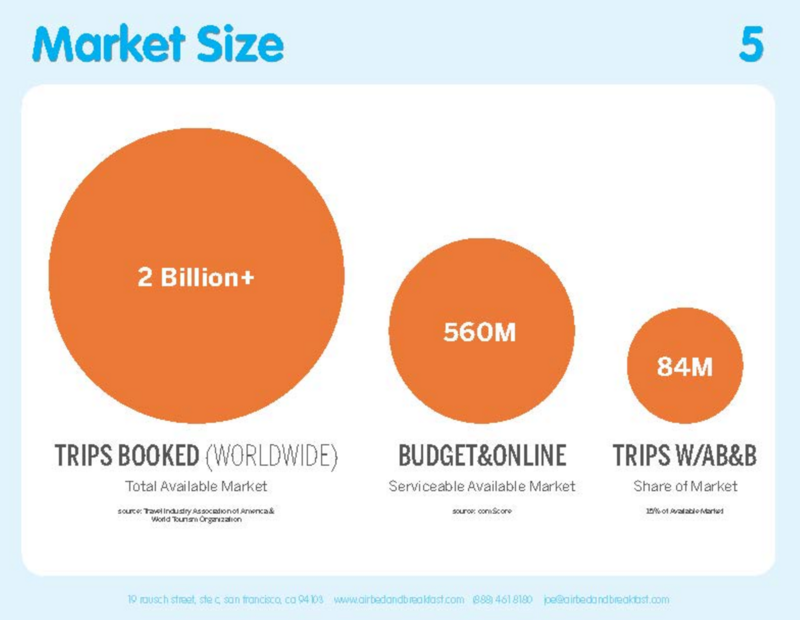 Market size can be measured. In order to give you a better idea on how to measure market size, I listed some of the valuation methods that you may want to familiarize with. There are more tools to measure market size but there is no need to go in-depth for the purpose of this article. Although market size can be measured, the determination of an entrepreneur is not easy to quantify. So how can investors measure how much entrepreneur is motivated? To better understand this, you may want to consider why you as an entrepreneur want to seed round. By now you should have a little understanding regarding why startups need seed round funding. Take a look at this image Steve Schlafman made for Business Insider. It explains why startups need to raise funding. 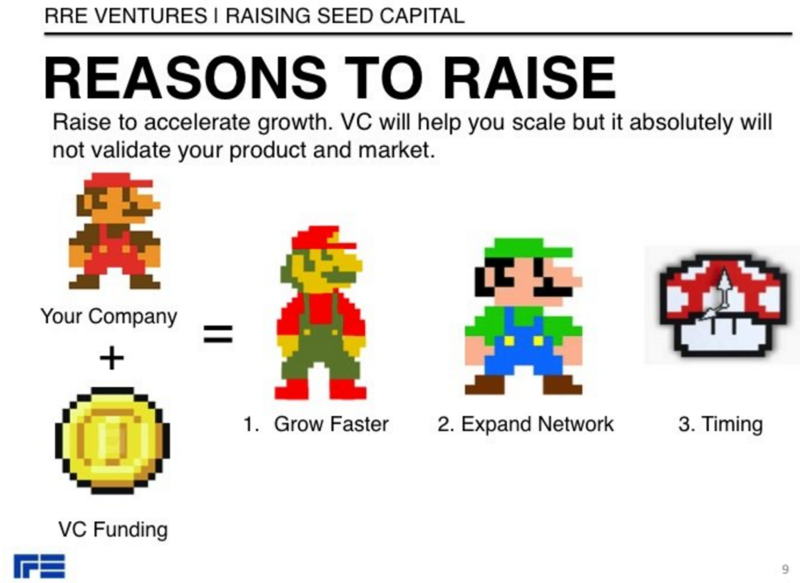 Let’s say that you are Mario from Nintendo video game and you just ran into a coin called funding. You instantly become bigger, and strong enough to compete with the tiny monsters, right? Actually, there is more to it than just that. Seed rounds tend to bring a large number of participants such as angel investors and institutional seed funds. Of course, it also depends on where you get funded from. They will help you access a wide range of networks and resources that early stage startups need so that you can become green Mario like above. As an early stage startup, you may not have many connections. If you do have connections, then leverage fully. For the majority of entrepreneurs and founders, you have few resources to scale up. Therefore, the seed round funding will help develop a good startup into a great one. When should you get seed round funding? This question may seem obvious but it is important to understand these fundamentals about the seed round. You should get seed round funding when you establish the direction and goals of your business. At this stage, the majority of startups are unformed in terms of direction. With so many different options for investments, it is easy to be confused or unsure about which option to choose. Read the following to learn more. Venture Capitalists (VC) are just one option out of many where you can raise your funding. You just need to make sure you evaluate the pros and cons for each source before making your final decision. Startup founders should understand the basic concepts behind various financing options. Here is a summary of pros and cons of each types of financing. The easiest way to understand the difference between VCs and angels is that VCs are pros and angels are semi-pro. Angels invest their own money whereas VCs invest other people’s money. Don’t get me wrong when I say angel investors are semi-pros – but most of the time, they invest as a hobby. Therefore, their decision making process is much faster. On the other hand, VCs require more time, more meetings, and there are more people or partners involved. They also have TONS of deals going on a daily-basis but invest in very few. Faster way to raise funding. Less complicated way to raise funding. An angel investor takes a risk. Money is not exchanged for an ownership stake in your startup. Precious knowledge for sustainable growth. Lower expectations in terms of rate of return or equity compared to VCs. 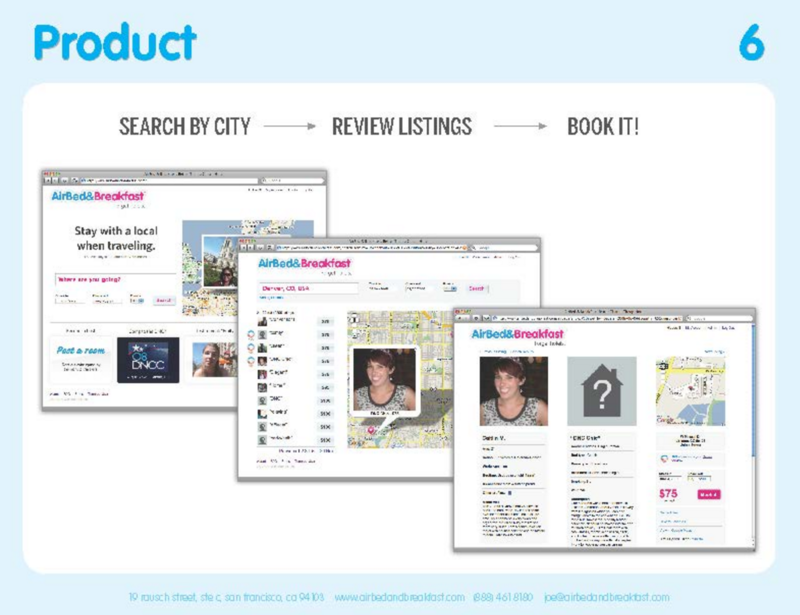 Suitable for early stage startups that require just enough money to bootstrap initial growth. An angel investor might set the bar higher due to higher tolerance for their risks. Less level of involvement compared to VCs. Therefore, you have less advise and guidance for your startup. Suitable for larger amounts of funding. High level of involvement with the management. Valuable source of guidance and consultation to help your startup make better decisions. Financial support aside, VCs can provide you with assistance in many critical areas including legal,tax, etc..
LOTS of cash & conncections. Raising capital from a VC is harder than an angel investor. Less control depending on the size of their stakes. Getting funded from your friends and family is the easiest way to raise money. If you choose to raise money from family, you could be playing a risky game. At the end of the day, you will more than likely be using someone else’s money to run your startup. If you fail or have any disagreement with your family, they can get very emotional opposed to angel investors or VCs. You need to make sure that you spell out everything clearly. You don’t want to mix business with your personal relationships. Get genuine feedback for you ideas. Less stressful environment when presenting your business plan. They may offer a helping hand when you need one. Could create tension between your friends or family. High level of involvement, maybe even too much. It could damage your relationship. Relatively smaller amount of investment. Despite the fact that bank financing is tricky, it is the most sought-out method. You want to educate yourself fully about interest rate and its process before start bank financing. Variety of range and payback options to fit your needs. Once you qualify, you will be funded relatively quick. The criteria is constantly changing. Whether you succeed or not, the founder must still pay back the loan. You may need an expert to better negotiate payment terms. This is one of the more modern ways of raising funds. The most popular crowdfunding websites are Kickstarter, FundersClub, and Wefunder. 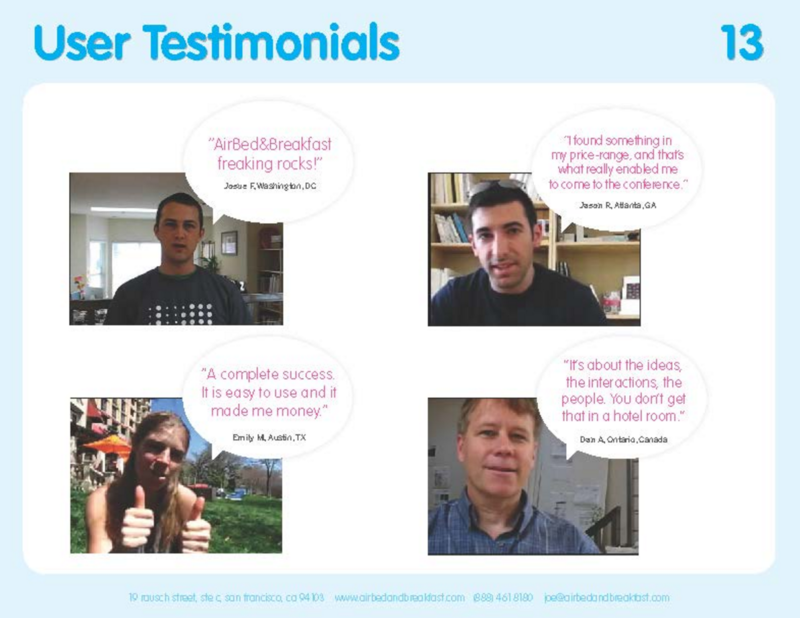 Many founders have utilized these sites to launch a product, run a pre-sales campaign, or acquire venture funding. The investors are most likely not involved with the day-to-day operations. As a startup, you will have great sense of freedom compared to the other types of funding. Of course, just like the other methods, there are also some downsides for crowdfunding. May help establish a first customer base. Control over how to reward your investors. You can start small for smaller project. Not suited for complex business or project. You cannot make lots of changes as you promised online. Each of these funding methods will have different length. Equity crowdfunding is the process where people crowd invest in an early stage startup in exchange for shares of the startup. No control over the way you operate. How long does it take to gain seed round funding? This is totally dependent on the demand for your offering. Truthfully, there are no rules. You can close in weeks if you have a competing offers. One thing that can be said, in most cases it will take longer than you think. Interestingly, Gil Silberman argued that getting funding faster than four weeks is unlikely. But still there are cases where startups have cashed within a week. 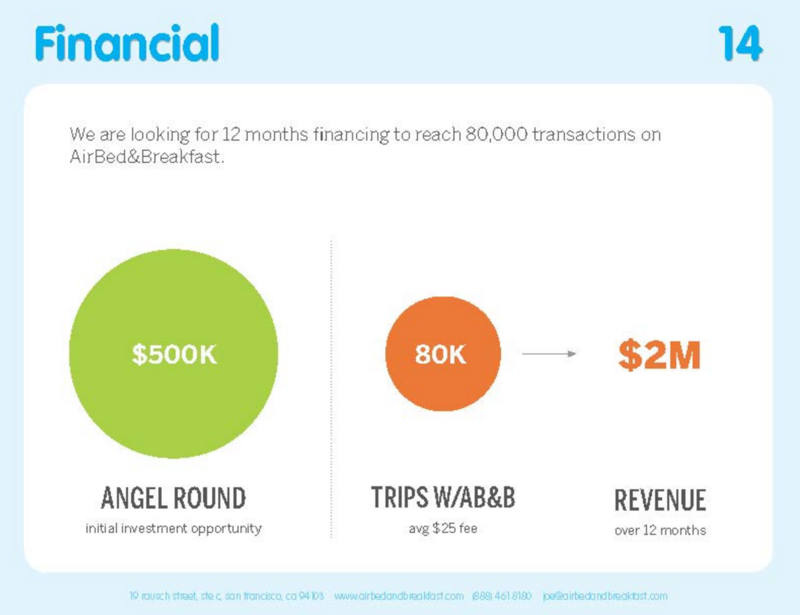 If you are pitching to angel investors, you might want to plan for 3 months before finding an investor. How often should I raise funding? This is a crucial point that many entrepreneurs often think about. How on earth can I raise funding and how much will I get? Entrepreneurs should raise enough money so that they can focus their efforts on growing their business without needing to raise more funds for at least 12〜18 months. A standard seed round takes a few months from the initial coffee meetings you have with your investors to actual money in your bank account. The main idea is that startups should IDEALLY only raise funds every 1〜2 years so that the focus is solely on building and selling their product or service. 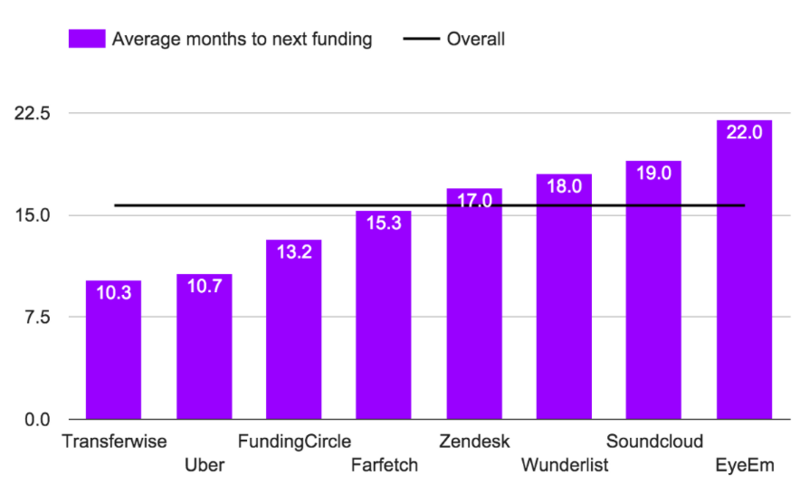 Here is a graph that shows the average time between funding rounds. According to the graph, it appears that 16 months is the average time based on the findings from Stephan Von Perger. How much should you raise in the seed round? This will differ depending on the type of products and services your startup will offer. SaaS startups normally aim for $750K in their seed round whereas hardware startups go for around twice that amount. $750K will allow you about 18 months of runway if you spend $35,000 a month; which is enough for four core team members to work for your company. This will allow you to still have a decent salary and extra capital in your bank account. After having knowledge about how much you should get raised, you probably wonder (at least I did) how should you allocate seed round funds. Founders should recruit their core team members wisely. Here is the typical startup team composure that has proved well for many startups. Two developers to manage the code, ops and customer support. One product manager to do UX, web-design, product testing and customer support. One business head to do operational, sales and marketing, legal, fundraising, and customer support. This is what a typical early stage startup workload looks like. You’ll likely have to work at least four different kinds of jobs EACH. Employees of early stage startups, including the founder(s), have to do anything and everything. Investing in these core team members is the smartest investment that a startup can spend money on. No people equal no product which leads to no business. It’s that simple. No employees means no finished products, which also means no business. What should you not spend your seed funding on? You want to avoid as much unnecessary costs as possible. Every dollar should go into the product or service. Needless to say, this product or service is made by people, you should spend 80% on payroll. Anything else is considered to be waste. A fancy office space is unnecessary. Having cool office furniture is unnecessary. A co-working space is a great way to start. An entrepreneurship conference, or any type of event such as this, is only worth spending money on if will lead in a sale or for marketing purposes. When you’re raising seed, it’s not about paying yourself a salary. It’s about making a product. Upon getting seed funding, many entrepreneurs treat themselves with personal check and not company’s check. I may sound harsh but I don’t even think founders should pay themselves in the first year. Jason elaborates that founders should allocate 90% of seeds into development and the rest in marketing. However, marketing part is only when you have clear business model or plan to increase your user base. founders should allocate 90% of seeds into development and the rest in marketing. Jason believes that this joke actually makes sense. As a founder, they should pay their people cash once the startup becomes a company. When you have a viable startup or business model means you already got a company. What do you actually need to get funding? Developing sophisticated documents for a seed round is not necessary. 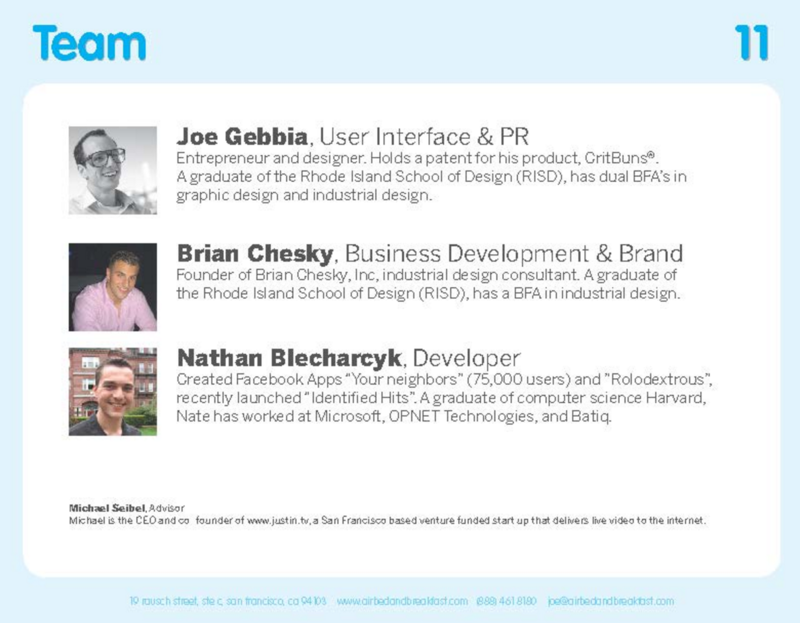 Slide-deck, with hard-copy so investors can show it to other partners. In your executive summary, you should include your vision, product, team location and contact info, traction, market size, and financial revenue. Your executive summary should preferably be one page. Don’t bother making pages and pages of documents that investors probably won’t bother reading. The slide-deck should consist of appealing and concise graphics, charts, or screenshots. It should be more than just words. The pitch is one of the most important items for preparing for seed round funding, so I will go further in-depth with this topic. 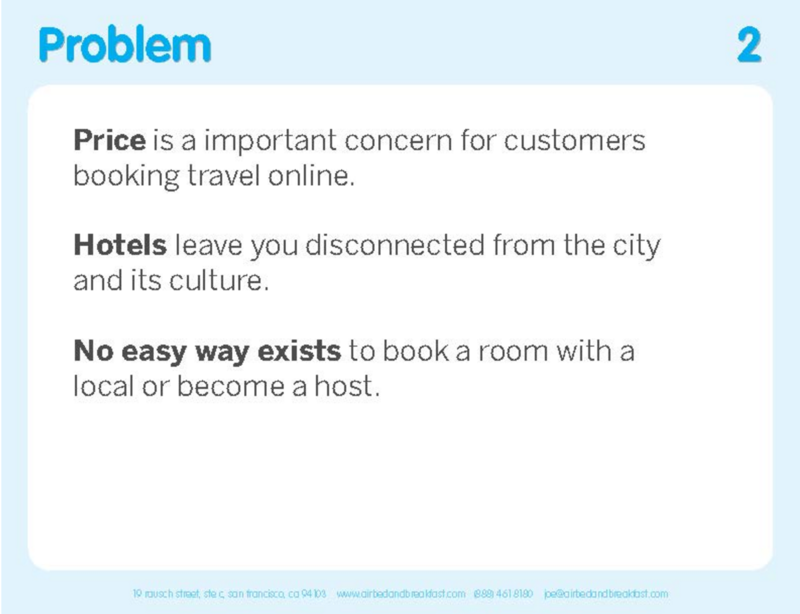 The following information is from the original Airbnb pitch deck that can be used as a great example. The cover slide should consist of the logo, company name, and tagline. 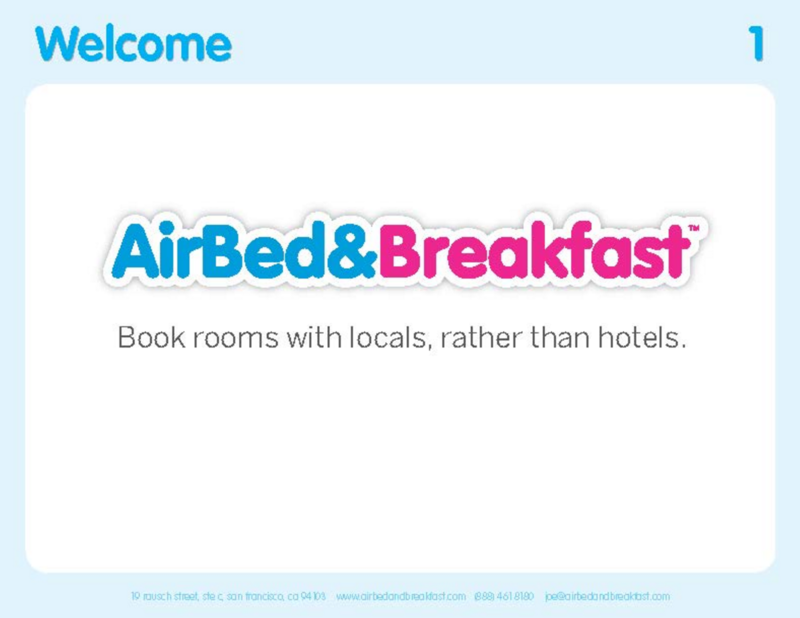 Perhaps the most important part of this slide is the tagline. Investors can get an idea of your business with this sentence alone. I have to admit. 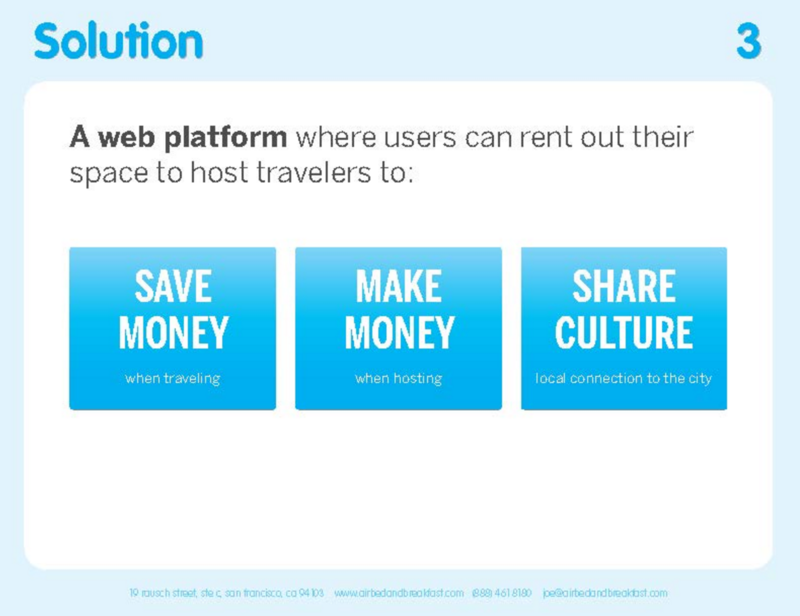 Airbnb nailed it on this slide. They pulled out every possible problem using just a single sentence. Just like the other ones, this slide is visually compelling and easy to understand. Similar to the previous slide, the solution slide should include why the customer should buy your service or product. This is your core value proposition. 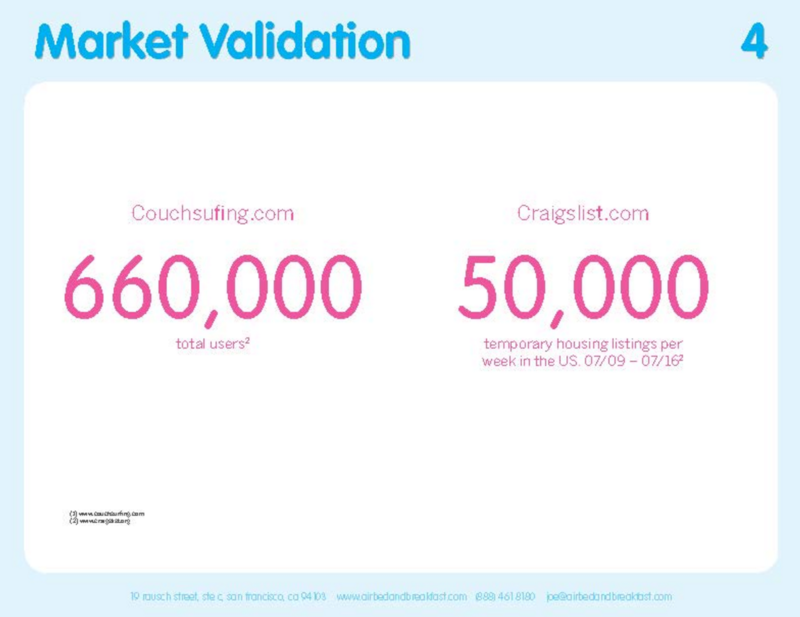 Airbnb pulled statistics from Couch-surfing and Craiglist to validate their market value. This is your chance to explain the size of your opportunity. It is important to verify this data using credible sources to backup your explanation. On this slide, summarize the core functionality of the product with a few words and images that will help investors understand what it is that you are actually trying to build. Using a video is another approach you could utilize for this slide. 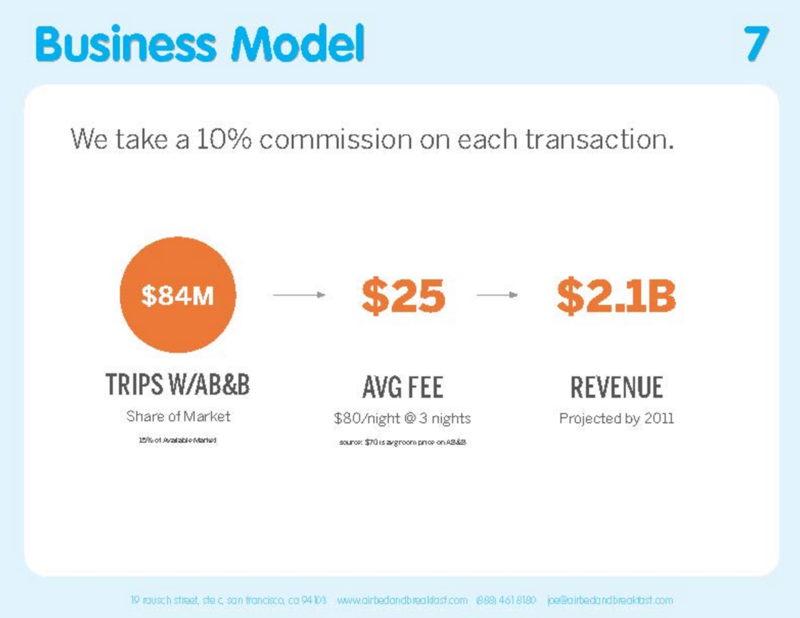 Airbnb takes a 10% commission for each transaction made. This is the company’s business model in a single sentence. If your startup business model appears to be complex, try to summarize it as much as you can. 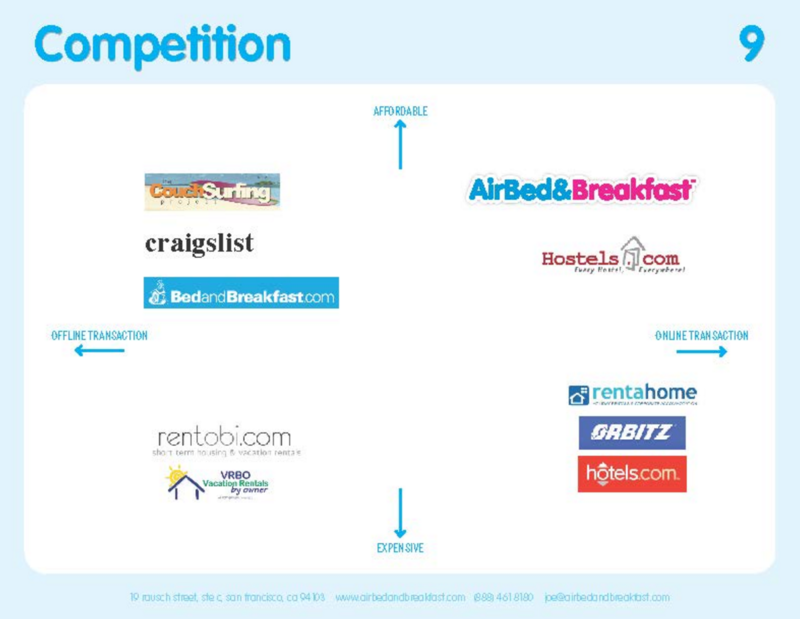 When you create the competition slide, you need to include two core differentiators for your product. Oh, and always put your product on the top right corner. Make sure to answer key questions before they come up. 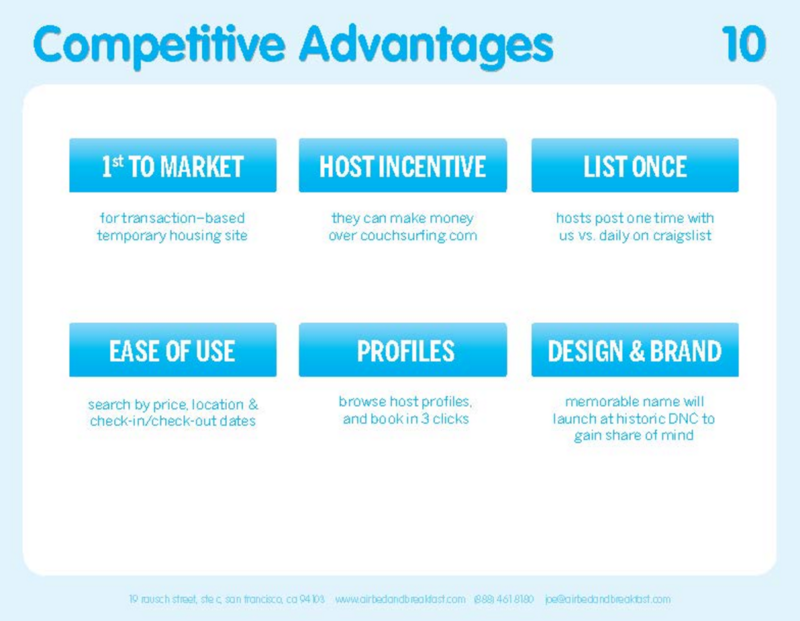 As you can see, Airbnb made bullet points with images about the core benefits. This is a technique you can also use to show investors how you can differentiate your business model from your competitors. Most startups seem to struggle when it comes to creating a team slide. They don’t include enough information about each team member. Only list relevant team members with their accomplishments, then include their academic titles. Investors are the ones that are risking their money. They want to see if your executive team is experienced. In the case that you already have customers, it is critical that you include them in the pitch-deck as it helps validate your startup. This is your punchline. This is essentially the whole reason you are pitching your business to the investors. The financial slide will show investors how much money you need, and why you need it. Seed round is to raise just enough funding to get the momentum for your product. Ideal amount of funding in seed round should be around 12 months 〜18 months. You should allocate a portion of your funding in human resources. 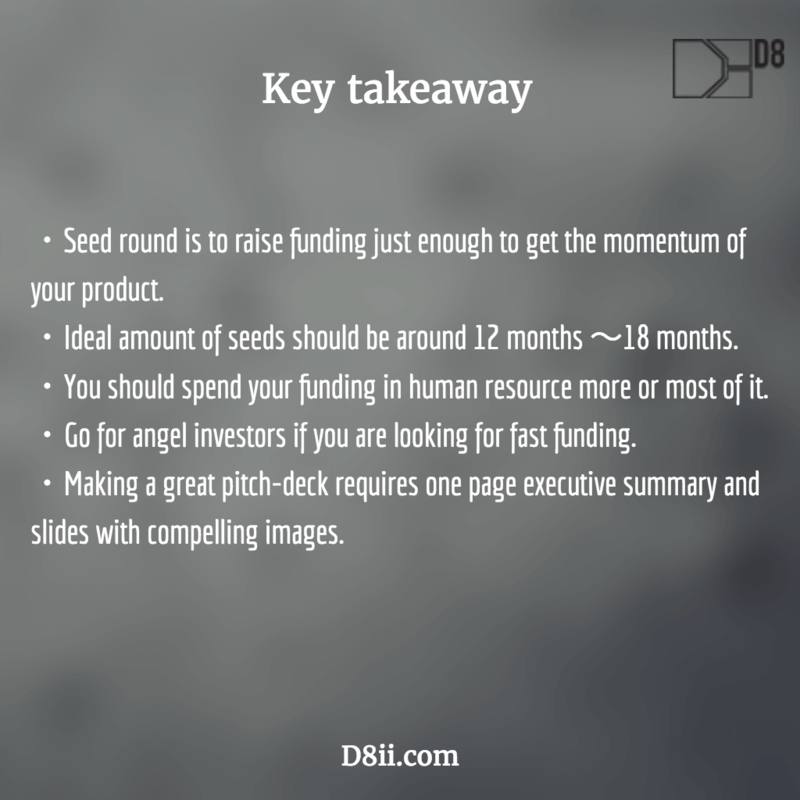 Go for angel investors if you are looking for fast funding. Making a great pitch-deck requires one page executive summary and slides with compelling images. I hope you succeed in getting seed round funding for your startup! Yes, it will take some hard work to raise the funding. But after reading this article, you should feel confident that your hard work is going to pay off. Great reading. Thank you. I am in the idea process of starting a new company. All the issues you mentioned make totally sense. But what if you have a family and no rich daddy that can support you during the early phase? Let’s face it – life is expensive (especially with kids at home) – so how do you manage on building a successful start-up when you can’t put food on the table?